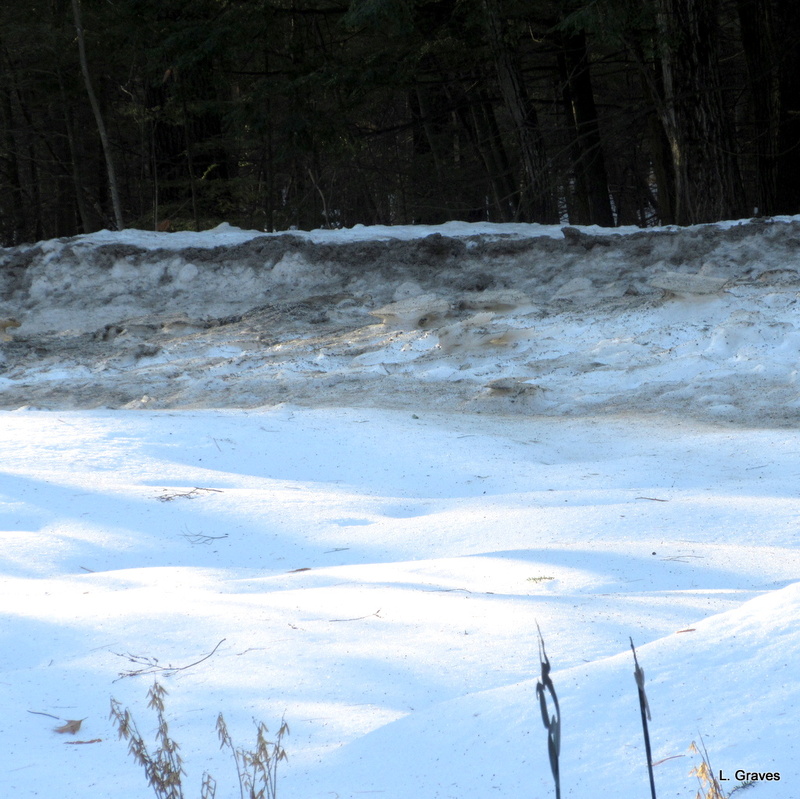 Last Sunday, we had very cold weather and eight inches of snow, both standard for Maine in January. Then yesterday, the temperature shot up to 49° Fahrenheit, and the rain came bucketing down, rapping against the windows, slanting into our faces, soaking our coats as we did errands. 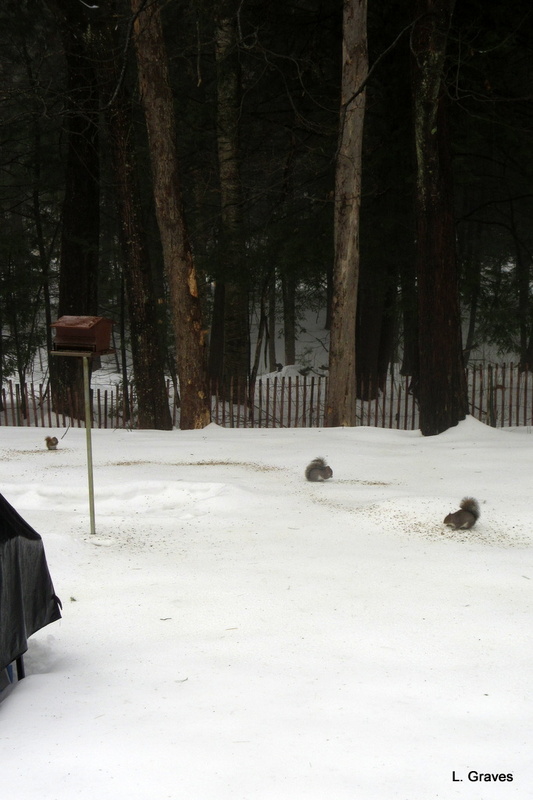 Before we left to do errands, Clif threw sunflower seeds on the snow for the ground feeders, which are often birds but in this case were squirrels. Then the wind came, fortunately not strong enough to knock out our power but strong enough to make it difficult to open our car doors as we went to the various stores. Last night the rain stopped, the temperature dropped to freezing, and this is what we woke up to. First, the good. 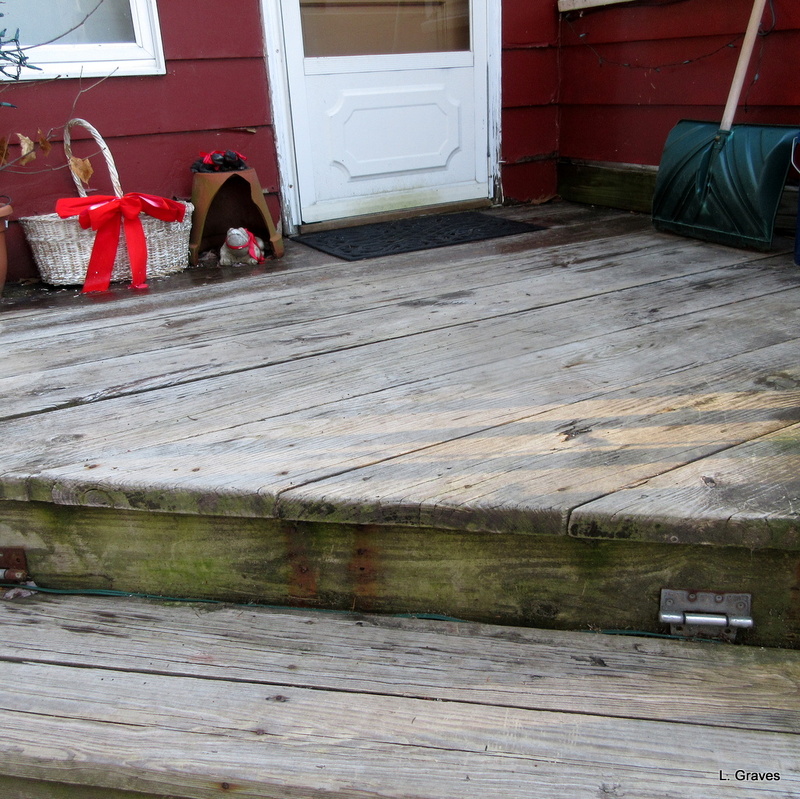 Our front steps are completely clear of ice and snow, no small thing in our shady yard. Second, the not so good. Our driveway is glare ice. As are the walkways to and in the backyard. And the snowbanks are as hard, dirty, and ugly as they are in March. Except this is January. Lura Beam is perhaps best known for her “noted memoir,” A Maine Hamlet. The opening quotation comes from that book, and I was much struck by it. Like Lura Beam, Clif and I are also Maine natives, going at least five generations back for both of us. We belong to Maine. It is a part of us, and we are a part of it. For most our lives, we knew the rhythms of Maine and moved knowingly through the seasons—the brilliant cold of winter; reluctant spring, which burst in a frenzy of blossoms upon us in May; beautiful summers, not too hot, not too rainy, just right; and the glory of fall, so bright and beautiful with its explosion of yellow, red, and orange leaves. But now, with climate change, it hardly seems as if we know Maine at all. Summers so hot that we can barely stand it? September being an extension of August? Rain and 49° in January? In what universe? In this one, it seems. We must adapt. We have no choice. But for Clif and me, two old Mainers, it is very disconcerting. I totally agree. It is disconcerting and a little discouraging to see what is happening to our planet. 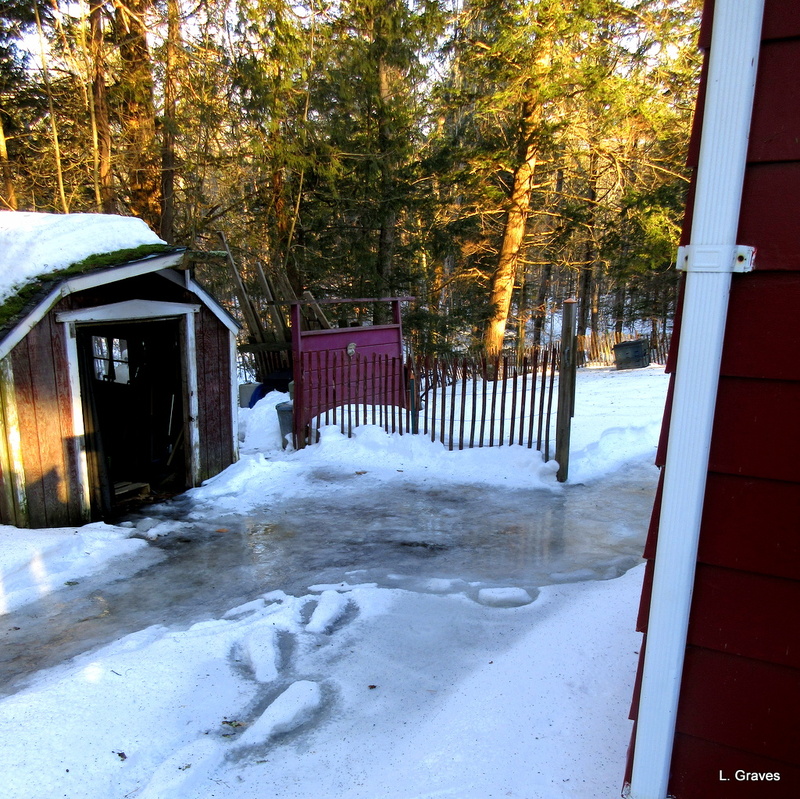 But it is nice to see our dirt driveway free of snow and ice. Too bad it’s a challenge to get to it, over all the other ice! But today is balmy and sunny, so we have to smile a bit, too! Sorry that climate change is messing you about so badly. That ice looks horrible. Oh dear take care. Hope the sand buckets are ready. Hope you have a lot of sand to spread around that ice! I very much liked the remarks of a schoolgirl who spoke at the Davos meeting where she said she didn’t want the rich and powerful to think about climate change, she wanted them to panic and panic now. Yes, I agree completely, we are having record heatwave temperatures here in Australia. However, that freezing ice looks more treacherous than our wilting garden…..take care, and stay inside…reading blogs is a good pastime for me in the heat…same for you in the cold, no doubt. Stay safe on that ice. Yes, and then our president tweets an idiotic comment about how a little of that good old global warming would feel good right about now! We had the same weather as you, and the same sheer ice everywhere. It really is disconcerting, not to know what to expect of the world we love. It’s hard not to know what to expect, especially when planning a garden. We’ve had a complete change here from the jet stream. Our storms in winter that came from the west used to drop snow in the mountains and sprinkle a dusting on us. If we were going to get big snow, it came up the coast like a hurricane. Now we get these big, destructive storms blowing across the southern plains and hanging a left to blow north up the eastern side of the Appalachians. Yowza! As for winter gardening and early spring planting? That’s a crapshoot. Stay warm! D > Knowing where you come from means (to some degree, at least) knowing who you are. Knowing you go back so far must mean that you identify with the heat or cold or dry or damp of the bedrock, the smell of the seasons… these things help make you who you are. So when the seasons start to change, and the bedrock that should be warm at a September mid-day is too hot to touch … If there is any place I identify with as the place I belong to, it is the Peak District in England, and there’s a connection that goes back several generations. But alas these connections get stretched to breaking point, or just dissolve, and they can’t be mended : we have to put down new roots where we are, and start from there. loved this post-especially about knowing Maine-well put-stay safe and warm! We had a share of your weather this week and it is disconcerting! After last weeks rain and ice storm we now have a snow storm and frigid temperatures on the way this week. I feel like our political news and weather will never return to patterns we are familiar with. I feel exactly the same about the disorienting weather. The comforting predictability of the seasons is slowly slipping away. Oh, and how I hate ice. Yes! The seasons changed, but we knew what to expect. Now, all bets are off. I hate ice, too. Very dangerous. I can tell I’m getting old – I’m more concerned about ice than weather. Stay safe. A topic we discuss almost daily here, in Maine as well, several towns over from you, we witness the bizarre and concerning weather patterns. It hurts my soul, this change, the witnessing of global altering ( often caused by human consumption and disregard for resources and simply, the natural world itself…just for its own sake). Lura Beam’s book ‘A Maine Hamlet’ is one of my favorite. Have you read Robert P. Tristram Coffin? I would love for you to come and visit me at the Liberty Tool Company museum, where I work during the winter filing books in the VERY extensive library ( amazing collection on Maine history!) and helping Skip on a new book he is writing about climate change and the Gulf Of Maine. Let me know if you feel up to traveling over this way and I will have lunch with you at 51 Maine ( my treat!!!). Great! You and Cliff would love the museum, especially the books on Maine history! let me know! That terrible-looking ice! 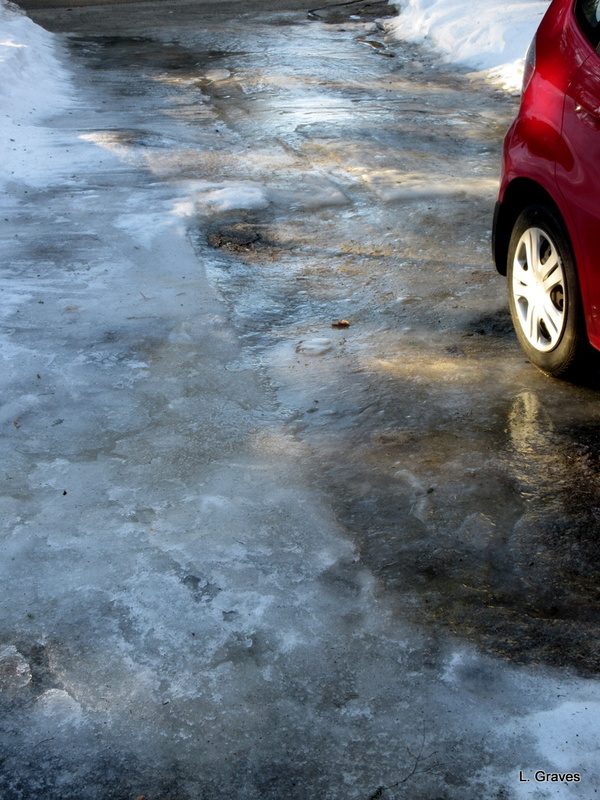 I can always cope with snow but ice… Ugh! Weather here is on the change too. Thunder and lightening in winter; stormy rain and then weeks of drought in summer; temperatures on the up and less snowfall. I am worried, worried, worried. You are right to be worried.